There are dog lovers, and then there are cat lovers. And while the question of which is better to have as a pet has been asked for a long time, we can agree on one thing – both dogs and cats are excellent human companions, and it is a matter of personal preference when it comes to which one you choose to have. The most important thing is to give them love and care and enjoy every second spent with your canine or feline friend. Cats are the second most common pet in the world, and out of all the breeds, Turkish Angora cats seem to be a very desirable one. But, why are they so desirable and how did it come to be? Let’s go ahead and find out below. What’s the nature of the Turkish Angora? How much does a Turkish Angora cost? 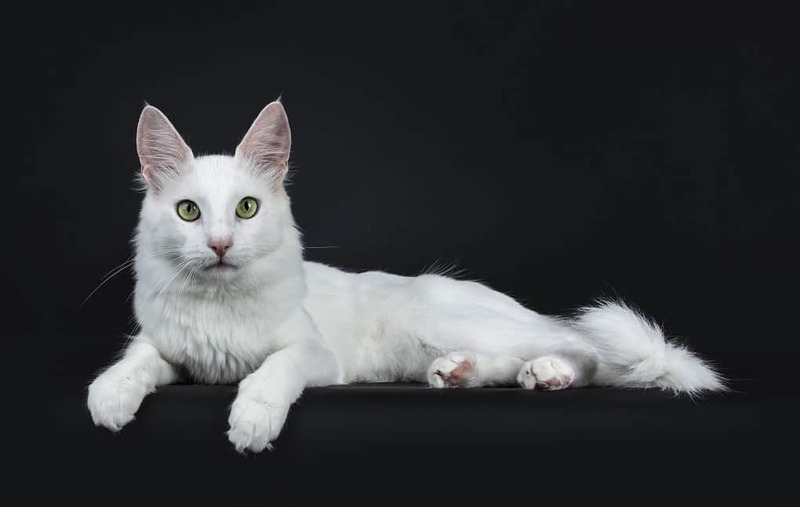 Much like the similar Somali cat, the Turkish Angora is both friendly and affectionate, being the perfect choice for a family with children or other pets. You can expect that your Turkish Angora feline is going to be by your side in any situation and ready to play at any point of the day. While they are affectionate and friendly, they require daily stimulation, and you should use every opportunity to challenge them physically and mentally. While there are a number of man-mixed cat breeds, Turkish Angora cats don’t fall under this category. In fact, Turkish Angoras are one of the oldest cat breeds out there, and having originated in Turkey, are considered as a rare breed that kept almost all of its natural and original traits. Being the descendant of the African wildcat, Turkish Angoras come from the Anatolian region and have been domesticated for many centuries. At first, only present in Turkish and Persian communities, Angoras appeared in Great Britain, Russia, and France in the late 16th century through importing. People were fascinated by the double genetic mutation of this breed (white, long hair), and that is why it very soon became the most popular domestic breed in Europe. It was officially recognized as a breed in the 17th century. It was at first seen as identical to the Persian cat. Still, these two breeds do differ, and it is more likely that the Persian cat was a result of Angora breeding. Angora cats are seen as a Turkish national treasure, and since the beginning of 20th century a preservation program has been organized by the Ankara Zoo to maintain and preserve the purebred white Angoras. Very similar to a Somali cat, Turkish Angoras are medium-sized cats with muscular bodies and long legs. Given their elegant body shape, Angoras are often suggested to be the models of the feline world. They range from 8 to 10 inches in size, and 8 to 14 lbs. in weight, which provides them with excellent athletic capabilities. Its hind legs are longer than the front, and it has round small paws that somewhat differs from other breeds. As of its overall looks, it has a triangular face and almond-shaped eyes that come in a blue, green, yellow, or amber color. One of the things that people love about this cat is it's always alert ears. The general appearance of an Angora is much similar to a snow weasel. Turkish Angoras have a silky long coat, and a fluffy long tail. The original color is white, but it is not the only color anymore, with chocolate, cinnamon, fawn, and mink becoming quite popular in the past few decades. While their coat is quite long, Angoras don't require much maintenance – in fact, they need only 1-2 grooming sessions each week. Given its physical standards, a Turkish Angora can live up to 18 years with proper care and nutrition. Angoras are a healthy breed for most of the part. One of the most important factors in preventing inherited medical conditions is to buy from a certified breeder that provides you with a health guarantee. The most common hereditary condition is deafness in cats with blue eyes. While not being as common, hypertrophic cardiomyopathy might occur in cats from the age of 2 to the age of 6 and is seen as a hereditary disease as well being more common in males than in females. When you decide to buy a Turkish Angora, be sure that it is not from a breeder that suggests they have an HCM-free line. No one can claim such a thing and it is vital that all cats have undergone HCM-screening. Those with an HCM condition should be removed from the breeding line through neutering. Although Turkish Angoras come with a beautiful long coat, it is not going to be much of a problem, as these cats don’t shed nearly as much as some other long-haired breeds do. This means that they will be fine with a few grooming sessions each week. Apart from that, you should bathe them a few times a year, and be sure to clean the corner of their eyes and ears with a damp cloth. You should also trim their nails a few times a month, especially if your Turkish Angora is indoors for the most part. Getting a Turkish Angora shouldn't be a problem as it has been one of the most popular breeds over the past few decades. While you will have a few local breeders in your area, you can also check online breeders that are certified and provide a health guarantee. Apart from that, with Turkish Angoras being among the most common breeds, there are a lot of them that end up on the street. That is why we suggest you try adopting one as a kinder option. The price can vary depending on where you live – but still, the average Turkish Angora will cost you somewhere between $250 and $400. On the other hand, if you are looking for a top-quality Turkish Angora, you are looking at a higher figure closer to $1,000. Turkish Angoras should be purchased before they are 3 months old. While the price might not be as high as with some other cats, you are still better of going to your local shelter and saving the life of one of these beautiful cats. There is not much to it other than looking for certain physical traits that a Turkish Angora cat should possess. Firstly, the back legs should be longer than the front ones, and they should have small and dainty paws. Along with that, the chin should be firm, and the neck should be slim. A Turkish Angora comes with a single coat that can vary in pattern depending on the given color. Eyes usually come in blue, green, amber, and yellow, and are almond-shaped. You should know that males and females are similar in size, with males being a bit more muscular. Lastly, the tail should be long and fluffy, and the ears always standing in an alert position. If you are looking for a cat that doesn't require a lot of maintenance and is great for your household, the Turkish Angora seems like a great choice. Why do we say this? It doesn't shed a lot and, although it has a beautiful coat, you will not have to do a lot of grooming around it. Apart from 1-2 grooming sessions per week, and some ear cleaning and nail trimming, there will not be much responsibility when it comes to regular pet care. On the other hand, you should know that Turkish Angoras are quite active and demand attention. While they are affectionate and friendly, they expect to be challenged, and they will not cope with you ignoring them. 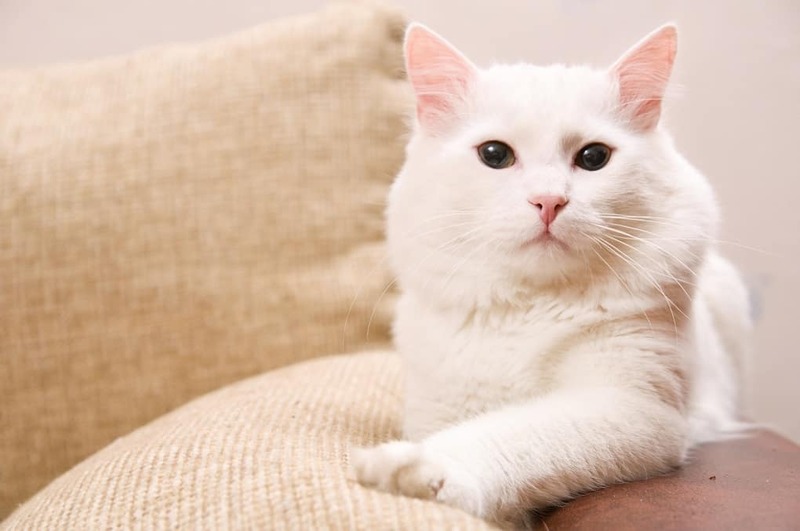 Given the typical characteristics of a Turkish Angora, we can define them as a playful cat that enjoys socializing with humans and other animals. With its athletic and muscular body, you can be sure that your Angora will require a lot of jumping and climbing space. It is one of the best cats to have around when it comes to affectionate and friendly behavior. It cooperates perfectly with dogs, especially if they are in the same household from a young age, and you can be sure that your children will have a lot of playtime and fun with it. You should know that a Turkish Angora enjoys being nurtured and will require a lot of attention on a daily basis. Apart from that, it is an intelligent breed which means that you should provide enough mental and physical stimulation for them to not get bored. Still, we suggest that you don't let them roam around the streets – instead, you should invest in proper indoor and backyard (fenced) conditions that will keep your cat happy and safe. When it comes to different types of Turkish Angora cats, there are a few different types and most vary in color. 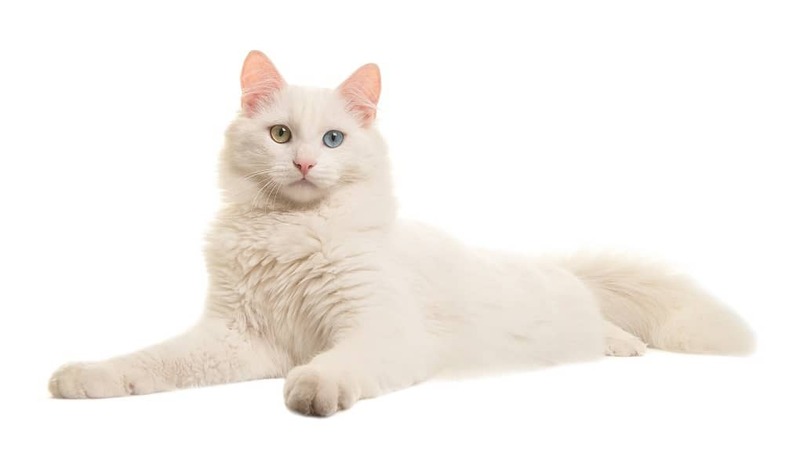 While the white color is the original and natural color of a Turkish Angora, other shades such as blue, black, red, and cream are an option as well. The pattern is usually ticked. A pointed pattern is a sign of hybridization and is not officially recognized. If you are looking for a breed that is similar to a Turkish Angora cat, it is the Somali cat. With similar physical traits and personality patterns, Turkish Angora and Somali cats are the perfect choices for any family with children or other pets. Apart from that, given its physical looks and genetic traits, Persian cats closely resemble Turkish Angora cats, which comes as no surprise, given their history. If you are looking for an all-round friendly feline companion, a Turkish Angora cat is an excellent choice. Affectionate, active, and intelligent, you will have a cat as your best friend.